Designed by Thomas Balaban Architecte (T B A), the project aims to redefine the veterinary experience for the Mile End neighbourhood, the dilapidated storefront space and dark basement are brought to life with a calming minimal palette juxtaposed against existing raw surfaces and generous glazed partitions. 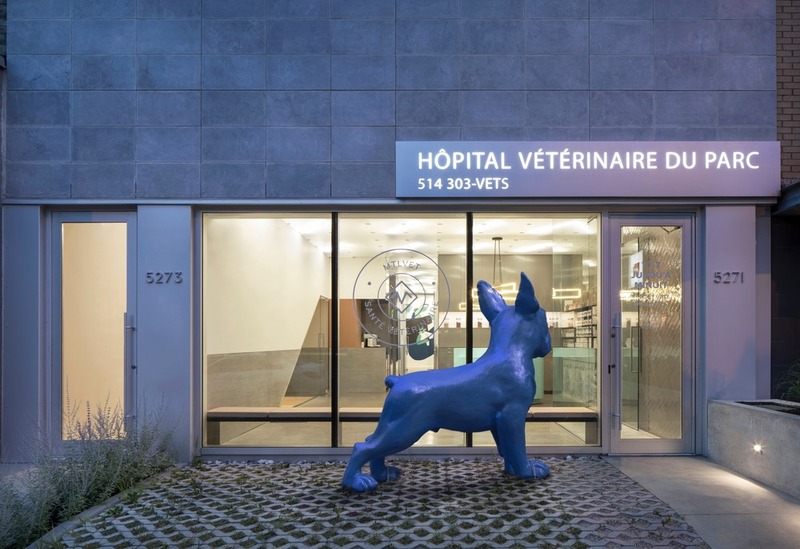 Utilitarian materials work within the neighbourhood?s aesthetic and the specific needs of a veterinary clinic. Stone foundations, concrete wainscoting and ceramic tiling protect the lower part of the walls required to be resistant to animal wear and tear, whereas milky polycarbonate ceiling panels hide a complex mechanical system revealing only modest graphic lighting. Technical spaces are efficiently organized around a central circulation spine, allowing for a spacious reception where animals and owners alike can circulate freely. Friendly custom furniture in Corian and orchestrated glimpses through glazed partitions seek to ease anxiety and subvert traditional doctors/clients/patients formalities.